We will preface this modification by noting that it involves 110V power. Unless you are comfortable working with AC power and wiring up outlets, it is probably better left to someone else to do for you. 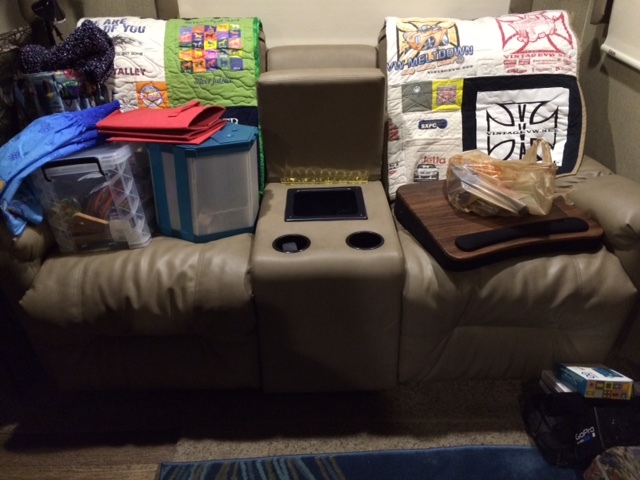 Our rig has the theater seating option. 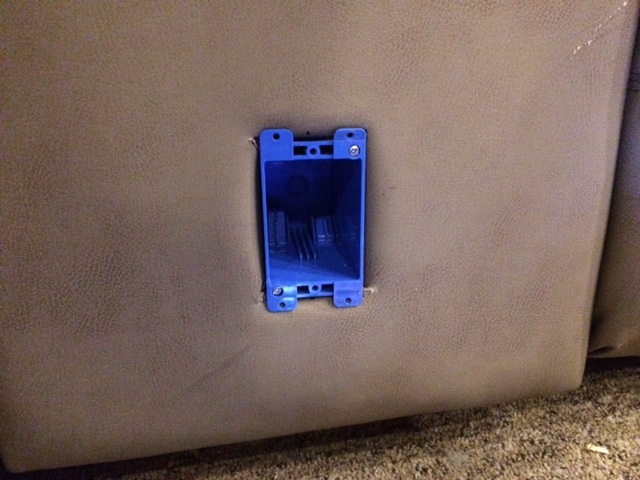 One thing we’ve found is that there is a single 110V outlet in the middle of our slide at the area where the theater seat ends and the dining area begins. 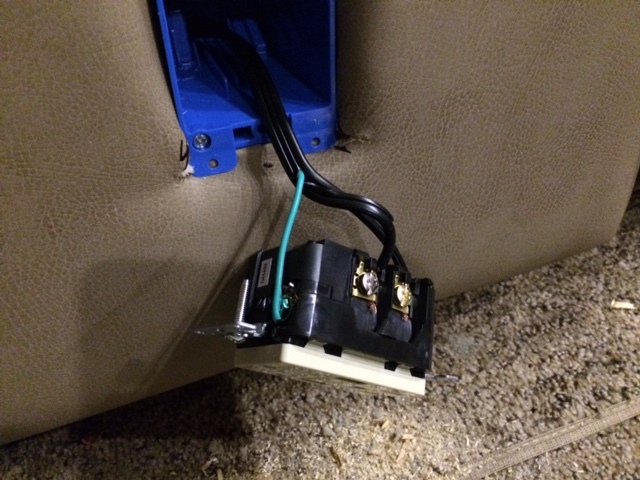 We had been pondering ideas on bringing 110V power to the other end of the theater seat unit (where Malcolm sits). 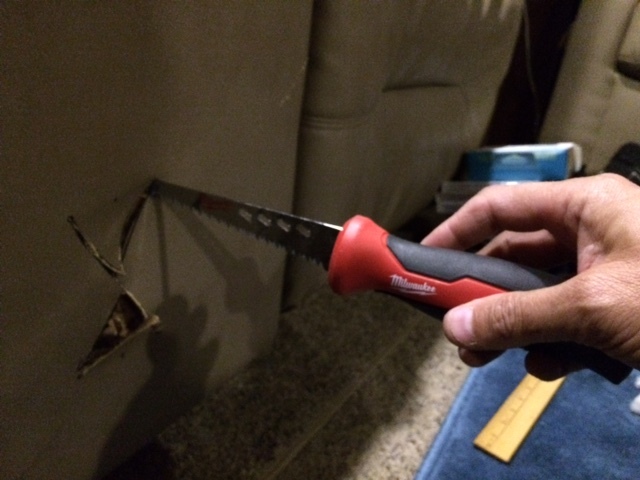 The last time we were packing up the trailer to move, our cat went into hiding behind the theater seats and we found her in the hollow center section by lifting the remote tray out of the unit. 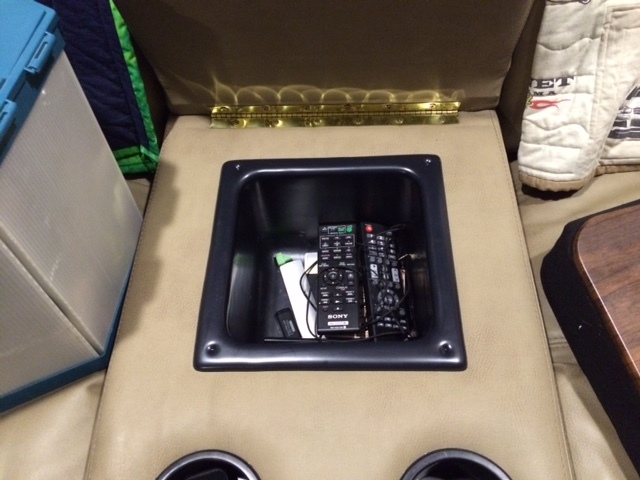 We started using that area for storage for “stuff” and it led to an idea for the mod described here – adding a 110V outlet to the front of the console. 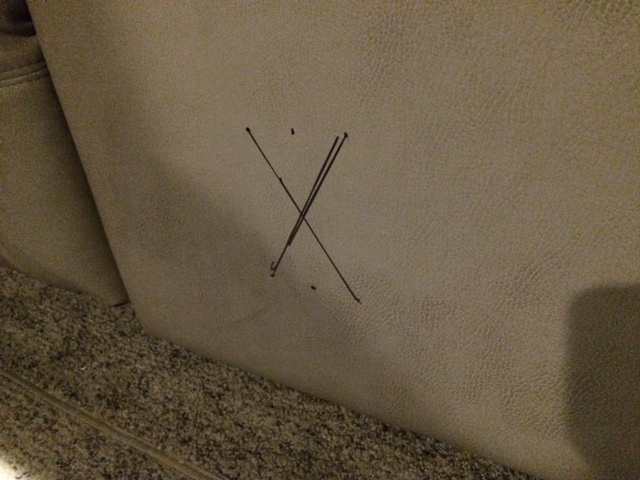 First, we marked the front of the console piece with the dimensions of the outlet box (fully enclosed box for safety), then cut the outer material in an X pattern so it could be wrapped around the opening later and look nice. 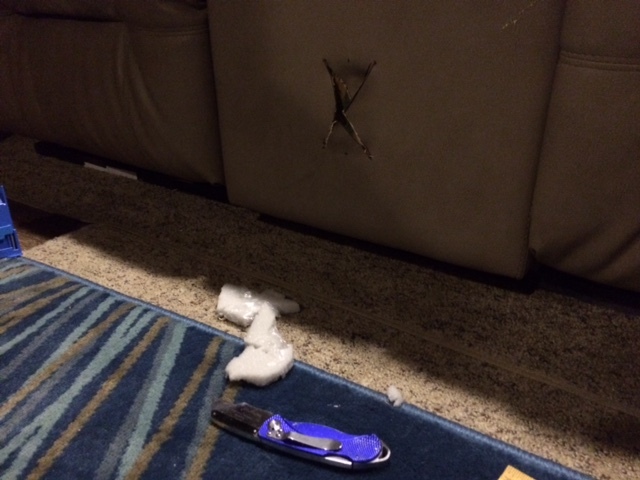 We also cut the foam padding out. 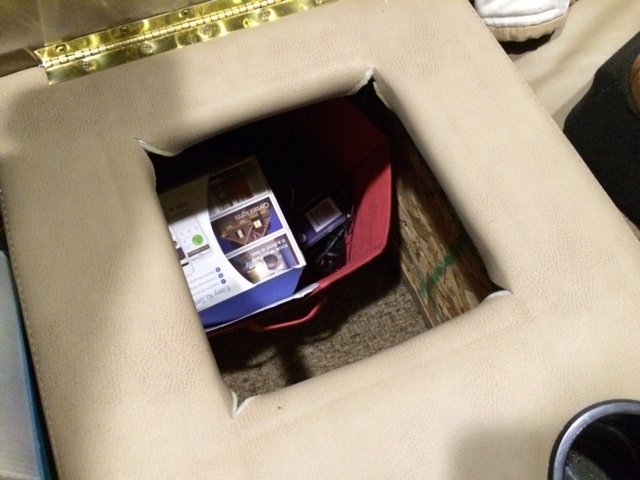 Holes were then drilled through the solid wall of the console (1/2″ chipboard) in each of the four corners. 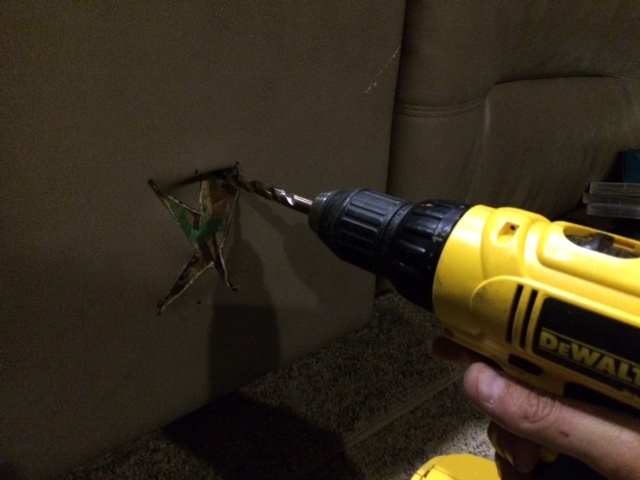 Then the hole was cut out with a keyhole saw. The box was mounted in the resulting hole and secured using the two wall clamping wings supplied on the box. We bought an electrical cord with a low profile plug on it and cut the end off. This was the shortest and cheapest cord they had at the store with the desired low profile plug (though there is room for a standard plug). 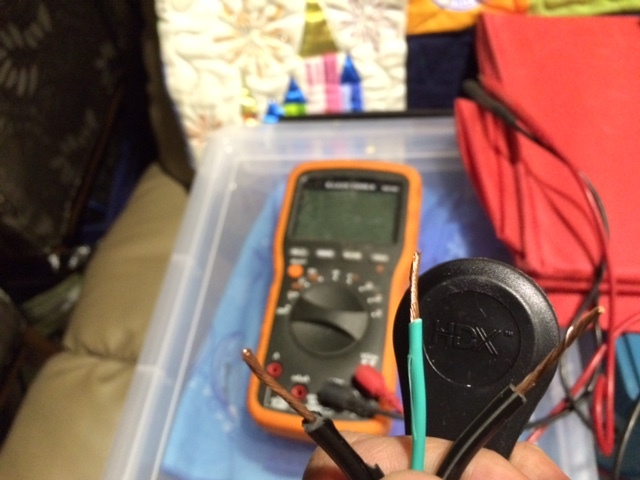 A multi-meter was used to verify the hot and neutral wires (since only the ground was encased in a colored sheath). 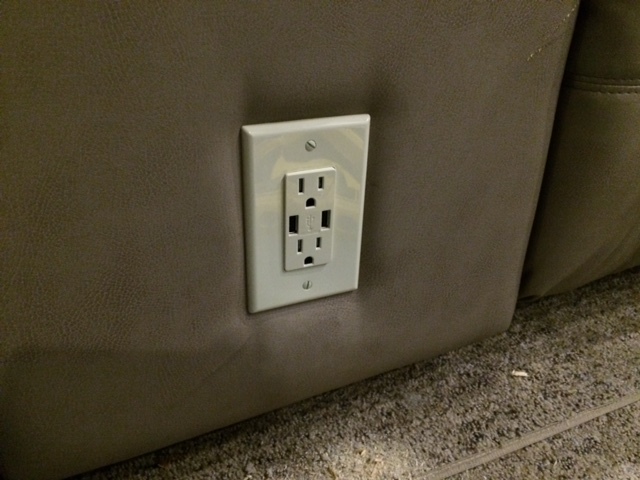 We chose our particular outlet because it has two 110V outlets and two USB outlets for charging devices. The wires were pulled into the box from the back and wired up to the outlet. The outlet was mounted and the plate attached. 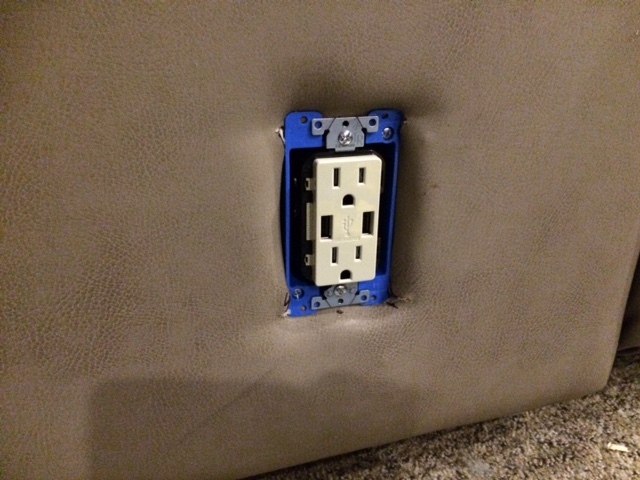 With everything put together, the plug was plugged into the 110V outlet behind the seating unit. No smoke or sparks came out, so that was a good sign. An even better sign was that Malcolm’s iPad started charging when plugged into one of the USB ports. We later tested the 110V outlets with the vacuum cleaner (cleaning up the sawdust) and subsequently Malcolm’s laptop power supply. Total cost for the project (minus the one-time purchase of the keyhole saw) was around $45. 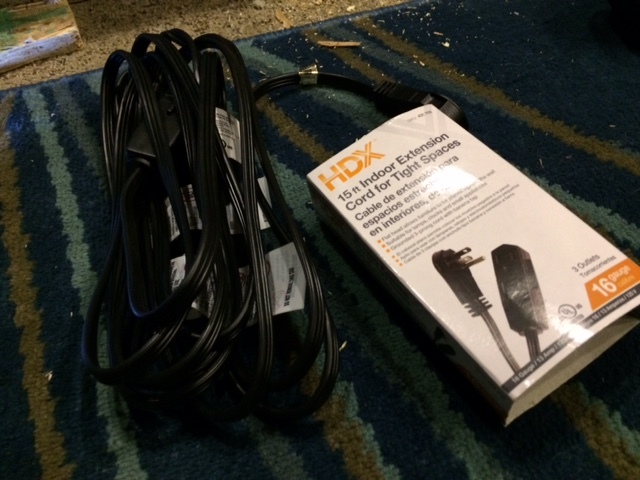 A less expensive power cord could have been used to lower the cost under $40. 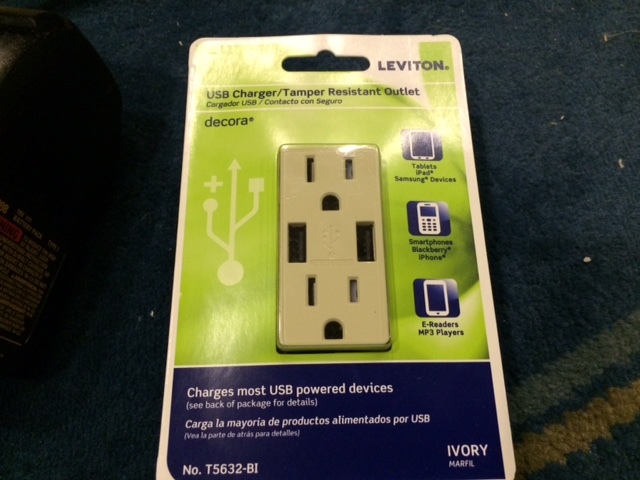 The major cost of the project was the particular outlet we chose with the USB connections ($24.97 plus tax).